Bowrings is a modern Australian farmhouse by Vibe Design Group. Not pastiche or reproduction, but a crisp, contemporary take on the classic. All the familiar features are present; stonework, weatherboards, distinctive roof profiles, and deep, spacious verandahs. Yet each has been reimagined, sharpened. The exterior is defined by its elevated position. Stonework rises from the landscape, creating a platform to take in views from Port Phillip & Westernport bays. The calculated contrast of old and new gives Bowrings interest, and ultimately its character. In every instance the building engenders a familiarity, yet also surprises through its thoughtful consideration of the needs of modern living. Vibe have embraced the learning of the past to design for the future. This is the elevation of the farmhouse from utility to luxury. 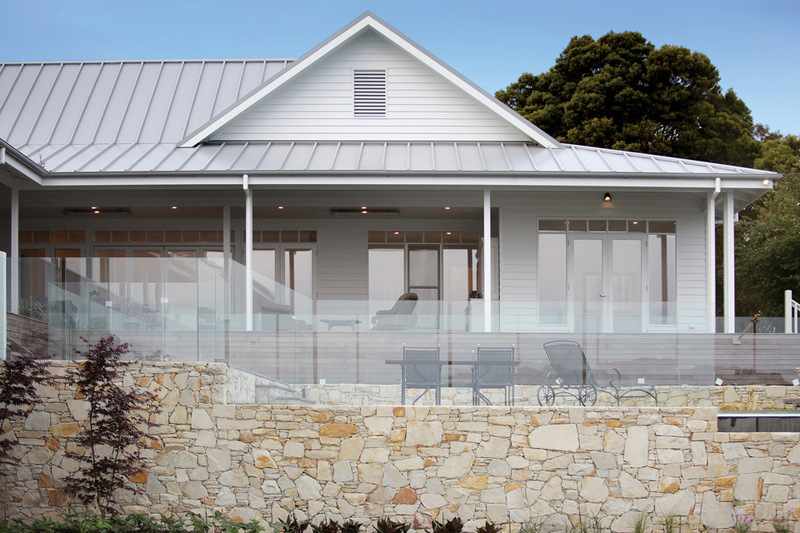 In this project Vibe utilised locally sourced natural stone, custom design roofing profile, Linea weatherboards. Vibe Design Group are a multi award-winning design practice, offering contemporary building design to the Australian market. All content is copyright © 2019 Vibe Design Group.